A last-minute goal by Celtic wonderkid Karamoko Dembele denied Hearts a share of the spoils as the Capital side were edged out 3-2 in a Reserve League clash at Cappielow. The Jam Tarts found themselves two goals down after less than 15 minutes played. Six minutes in, Dembele’s free-kick was headed across goal by Marvin Compper for Wallace Duffy to nod home from inside the six-yard box. And Compper powerfully headed Armstrong Oko-Flex’s corner into the net just eight minutes later to put Celtic two up. 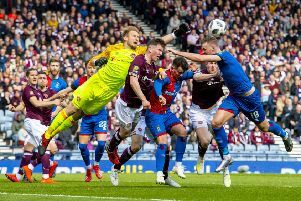 Hearts pulled one back ten minutes after half-time when Lewis Moore collected the ball inside the box to curl a shot past Ryan Wallace in the Celtic goal. Midfielder Andy Irving pulled the Jambos level on 64 minutes, scoring direct from a free-kick. Dembele came close to putting Celtic back in front on 78 minutes but his powerful shot clipped the bar before going over. However, the 16-year-old wasn’t to be denied as his free-kick from a tight angle found the back of the net in the final minute to give the hosts victory. Celtic: Wallace, Duffy, Church, Welsh, Compper, McInroy, Dembele, McLaughlin, Bayo, Aitchison, Oko-Flex. Subs: Willison, Mazis, Diver, Coffey, Savoury, Caffrey, Robertson. Hearts: Mason, Brandon, Shaughnessy, Hamilton, Burns, C Smith, Cochrane, Irving, Edwards, Moore, Henderson. Subs: Silva, Sandison, Mason, Logan, Ward, Makovora. • This report was compiled via updates from the @CelticFCAcademy Twitter account.